Saturday night I went to the movies to catch “Iron Man,” which turned out to be much better than I had anticipated. I found that I was particularly mesmerized by Downey’s performance, and thought it was one of the best action-hero flicks I’ve seen in a while. After the movie, I headed to The House of Pies for my usual patty melt with a cup of coffee and a slice of egg-custard pie for dessert. It’s your typical American diner and there’s nothing retro about the décor. According to the manager, they’ve done little upgrading since it first opened in 1964. I took my usual stool at the counter. The place was buzzing, and a lot of spirited conversation seemed to be going on, especially with the two gentlemen sitting to the left of me. “Just a repeat of 1980,” said the other guy sitting next to me. Whenever I had to get gas during that time, I made sure to bring plenty of work with me. I remember writing an entire term paper for English in one of those lines. But what hardship we endured affected us mostly in terms of convenience, not economics, since we already had become fairly accustomed to rampant inflation during the seventies. One of the funniest things I remember when gas crossed the $1 threshold was that many stations had to sell it by the half-gallon, since most pumps back then didn’t register more than 99.9 cents. The waitress set down a cup of coffee and took my order. Earlier that day, CNN reported that the national average for gas is now $4 a gallon, though here in Houston, were still hovering around $3.89. With no end in site, I imagine it won’t be too long before we’re well past $4. “Well, don’t know about that. But if it keeps getting any worse, I’m going to be getting rid of my truck. Going to slap a “For Sale” sign on her and kiss that baby goodbye” said the other guy as he stood up to leave. In 1980 I was a full-time student at Cal-State Long Beach. I was on the GI Bill that provided me with a monthly check for $348. I also took home about $360 a month by working 20 hours a week as a tour guide on the Queen Mary. Altogether, my total monthly income was a little over $725 a month. Rent was $150. Electric and phone was around $18. The only other expense I had was car insurance that averaged out at about $12 a month. I didn’t have a car payment. The car I had at the time, a 1971 Toyota Corolla station wagon, was easy on gas and fun to drive. It had a 1.3 liter engine that put out about 110 horse power and got about 26 miles to the gallon. Not very efficient compared to today’s four cylinder engines, but certainly much more efficient than most V8’s at that time that averaged about 15 miles to the gallon. I did drive around a lot, then, especially with many weekend excursions to Los Angeles. After gas had crossed a buck a gallon, I cut back some, but not much. Still, I never spent more than $7 to $8 a week on gas. Even though money was tight at times, I never felt like I was impoverished. After I added in my monthly food budget of $60, I still had over half of my monthly income left. Much of that was used to buy books and cover student fees, but I still had enough left where I could go out to eat on a pretty regular basis. I looked at the patty melt and fries my waitress placed in front of me. There isn’t anything more satisfying then the aroma of a hot toasted sandwich off the grill, and a plate of sizzling fries straight from the fryer vat. I asked for the ketchup bottle from the guy sitting next to me. “That may be true,” I said, “as I took a small bite from my patty melt, “but what I don’t think anybody is taking the time to look at is the ratio of income to the cost of gas, food, shelter, and other expenses.” That is the rub I have with this guy who doesn’t think there’s any real difference from then and now. In terms of adjusting for inflation, items today may not cost much more than they did twenty-five, thirty years ago. What has changed. though, and what makes us pay more attention to ever increasing prices, is that the ratio of income to the cost of gas, food, and shelter has become disproportionate over time. In my estimation, wages have not kept up with inflation over the years, and as a result we are making less but paying more. I grabbed a napkin and took out my pen from my pocket, adding up my expenses for food, gas, car insurance, and utilities. In 1980, my total expenses only ate up 36% of my net income. I added up my expenses that I’m spending now on those same items and discover that it takes up 54% of my income. Thus, as I explained to him, I am actually paying more with less. He didn’t have a response right off. After a few minutes he looked at me and said, “Never thought of it that way before.” He picked up his tab from the counter. “How much was a cup of coffee and a slice of pie back in 1980? He shook his head and walked toward the register to pay his tab. I went back to finishing my egg-custard pie. As I was taking a bite, I thought back on the movie I seen earlier. If only we could develop a power source similar to Tony’s “Ark Reactor,” but on a much larger scale that would not only propel our vehicles, but also provide energy for entire cities. In the movie, Tony (aka “Iron man”) is referred to as the “da Vinci” of our time. Today, more than ever, we need real Leonardo da Vinci’s to address the myriad of problems were faced with today—not just with oil dependence, but with the depletion of other natural resources, pollution, emerging economies in third world countries, and global poverty. Having Tony Stark would solve a lot of problems. I really liked Ironman---Robert D Jr is a man of prolific talent and questionable judgment, but he was excellent in this movie. Gwyneth P was a big disappointment---the most talent she showed was staying up on her shoes. Yes, I think he would. Thanks for commenting. Yeah, I was kind of surprised by Gwyneth's performance. Not quite what you'd expect from her. Your post brought back memories of the frustration my parents went through during the gas crunch of the late 70s. 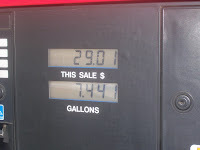 Out in California, you can expect to pay over $5 for premium and about $4.50 for regular unleaded. What amazes me is that the roads and freeways near my house are still congested on the weekends. Yeah, my daughter's a student at UC Davis, and she said they're paying $4.56 a gallon. That's just nuts. But as I heard on the news, we could see $5 a gallon gas by the fourth of July, and $8 a gallon gas by Christmas. It's going to make for an interesting election year, that's for sure.